Fast-drying towels that fold up easily into any bag for simple traveling. Splish splash it dries you so fast! Love it! Packs so small and dries you off even when wet. When is a towel more than a towel? When it’s lightweight, anti-microbial, quick-drying, and sunburn-preventing. Like this one. The fast-dry towel from Discovery Trekking Outfitters is made from an innovative fabric that’s designed to pull the water from your skin and then spread the moisture across the surface area of the fabric so it evaporates quickly. The absorbancy is almost unbelievable; you don’t have to rub, you just touch the towel to your skin and the moisture moves to the towel like a magnet. And after you’re dry, the towel itself dries incredibly fast (up to three times faster than typical cotton towels). 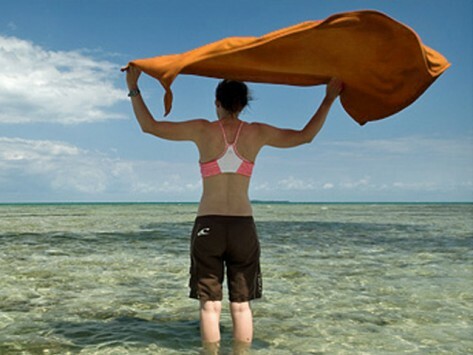 Leslie Hanes, founder of Discovery Trekking, created the towel to be the perfect companion for swimmers, hikers, travelers, and beach goers like herself. She infused the fabric with built-in Silver Salt anti-microbial technology to discourage bacterial growth (you won’t miss the smell that most towels harbor when they’re soggy), and SPF sun protection. It’s everything you need to stay dry, cozy, and protected from the sun.